Lovebugs Rescue is committed to providing medical care above and beyond routine vet care. We take in expensive medical cases on a regular basis, but need YOUR help to continue these efforts. Please consider sponsoring one of Lovebugs today! 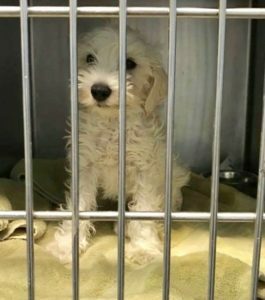 Hope was discarded at the vets office in a cardboard box with a death sentence…PARVO. Thankfully, someone contacted us and asked for help. PARVO is expensive to treat, but we know from experience that with immediate treatment, dogs have a high success rate for recovery. Please consider sponsoring Hobie, so that we may continue to say YES to dogs like him. 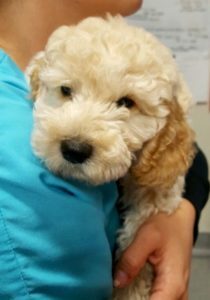 Poppy is a 9 week old female Goldendoodle puppy that was brought into the vet with a PDA heart defect. The breeders were not willing to provide her with the surgery she needs, so they surrendered her. The vet contacted Lovebugs Rescue, and we said YES, we can help! Now we need your help to raise funds for Poppy’s surgery. Please consider sponsoring Poppy. Tiny Ethel has had a rough start at life. 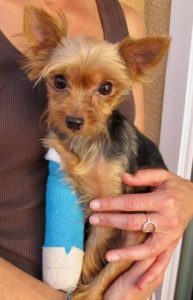 She broke her left wrist as a puppy while with her breeder, and had a plate put in. She recently broke her right wrist and thankfully Lovebugs Rescue was able to get her into surgery before any long term damage set it. We are still asking for donations to help pay for this expensive surgery. Please make a donation if you’d like to sponsor Ethel! 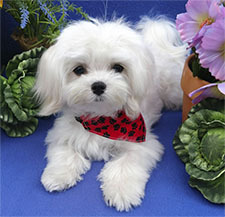 We received a plea to help this purebred Maltese puppy because he was born with a heart birth defect called Patent Ductus Arteriosus (PDA). Thanks to Lovebugs Rescue, Baxter has had his surgery and had been adopted into his forever home. Despite our fundraising efforts, we are still seeking donations to pay for this surgery. Please consider sponsoring our sweet Lovebug Baxter!